My husband, Daniel, and I are pleased to present, for your convenience, the American Endurance Ride Conference (AERC) calendar in Google Calendar. These calendars contain endurance rides gleaned from the main AERC calendar, but are viewed on a standard calendar view. Each region is shown on its own calendar sheet. If you have a Google account, you can view multiple regions on the same calendar sheet and/or copy an event to your personal calendar. Below is a view of the month of September for the MW and SE regions combined into one view. Where there are GPS coordinates available, we have included those on the Google Calendar as well. Clicking the Map link for an individual ride will take you to Google maps where you can view the ridecamp location as well as get driving directions from your house. Please be sure to verify the directions from the ride flyer or ride manager! There is also a link from the Google Calendar event to the AERC calendar page where you can download ride entries or link to the ride's web site. 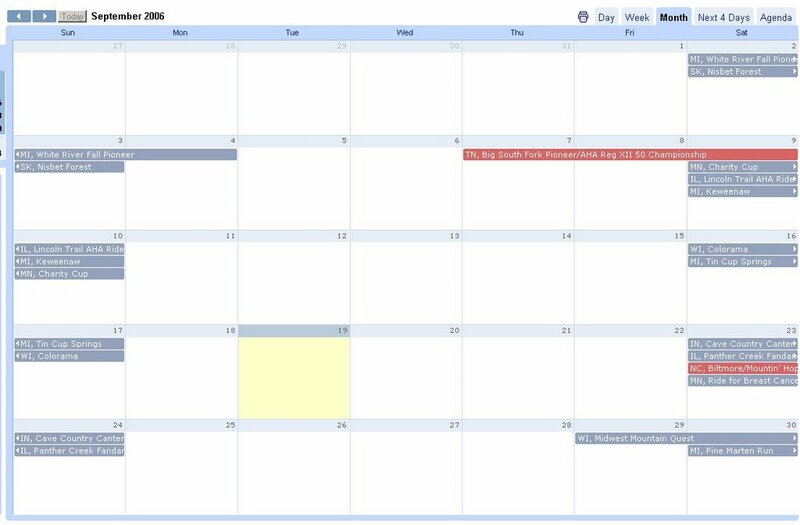 Click the picture below to get an example of an event in Google Calendar. The AERC Calander is so cool! I hope you keep it up!